The old foundry was a remarkable building. It presumably had been constructed or extensively repaired after the fire in 1826. It consisted of brick arched cellars into which materials such as scrap iron, pig iron, coke etc could be discharged either from Waterbeer Street to ground level openings, or in the rear in Trichay Street. 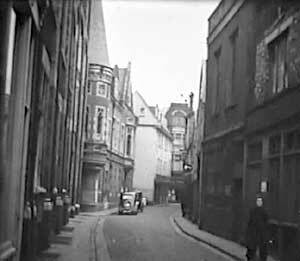 This street went from Waterbeer Street, passing St Pancras Church to the rear of Mansfield's Antiques and workshops in North Street. The ground floor was slightly raised about 2 ft above street level and comprised the foundry sand floor for moulding, the cupola being centrally placed with back to the yard on the east side. Against the west long wall were six brick based forgers for blacksmiths, with chimneys from each extending the whole height of the building. The first floor was carried on cast iron pillars and cast joists with iron or slate slabs, so making a fireproof floor above the molten metal of the foundry. This was used as a wareroom for storing items for the various departments like pipe fittings, electrical goods later on, semi-finished products for and from the smiths, etc. The second floor was a timber one carried on wood joists with oak main beams 30" x 15" in section and well seasoned so that you could only drive a mail in perhaps 6 inches. This floor was originally used by the whitesmiths, making tinned iron, copper, tin vessels, also leadwork, etc. In the 1920/30s there was a plumber and tinsmith. On the west side there was a long thick and ancient bench on which had originally stood the five or six more braziers in which they heated their irons for soldering, or pots of lead for wiping joints. On my return with a degree, I had the job of getting some sheet iron pipe joints made. I therefore carefully drew out the developments for the pieces of sheet to make the tee joints of varying size and proudly presented these to Bill Andrews. He looked at it and said it was a pity I had not seen him first. He then proceeded to cut two circles corresponding to the diameter of the pipes, after looking at the junction angles cut a wooden stick calculated by the rule of thumb, nailed discs to each end, chalked a sheet and roll the contraption on the sheet, making his mark, and then said, "there is your development, I bet it took you longer than that" Later, I saw an old book giving these practical solutions for many items. Then above the second floor was the roof space, into which had been put patterns not in general use. I think pattern maker also use part of the second floor, where we also had lathes and a drill, which were used by the smiths and one turner. The blower for the cupola was originally driven by a gas engine, which with shafting, belts and pulleys also drove the lathes, drills etc. By the 1920s, electric motors provided the power. Also at the Waterbeer Street end, all floors have opening doors to enable the hand crane - chain type - to load and unload items from the street to each floor, the crane mechanism was in an extended roof space also opening for verbal instructions from below. 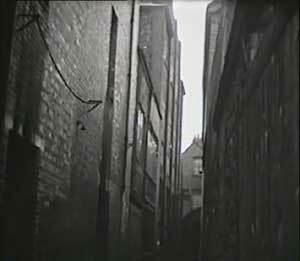 Being near the police station, which was near the Goldsmith Street end and opposite the rear entrance and cells of the Guildhall had disadvantages. If the court in the Guildhall, or an inquest was short of jurors, the police could and would pick them up from the street, and our workforce was an easy source. However we did get some co-operation, and if we were casting or other urgent work, they would not take them. When we were melting, the smoke from the cupola occasionally descended like a fog in the High Street, or Waterbeer Street or the Guildhall, but as we had been there almost as long as the Guildhall we got away with it, especially as there was no detailed environmental laws on the subject. The cupola was of course hand filled from a stage which had a hand crane, later electric, bringing the raw materials, up from the cellars to the loading platform. One side of Waterbeer Street was mostly the rear entrances to the High Street shops. Opposite our yard entrance was however a small court of about six cottages which were lived in until the late 1930s. On the other side were warehouses such as Hearns the currier's and boot and shoe wholesalers, Horswells the wholesale grocers, next to us, the Danish Bacon Company, and on the west side of us were Rowe Brothers plumbers and paint merchants, who used to lay their roles of sheet lead out in the road and measure and cut them to the size needed. Foot traffic got by, if necessary. They like us, had four floors with crane, so the traffic was often halted while one of us loaded or unloaded. Rowe Brothers moved in the early 1920s to the old Victoria Hall, which had been burned down in a night in 1919 after a recital by Paderewski. My parents woke me and we saw the blaze from 3 Pennsylvania Crescent. There was also a cafe called 'The British Workman', run by the Badcocks, very popular, cheap but good value if a little basic serving from the 1910/20 period until 1945. Likewise the long bar at Hexter's Vaults, North Street was popular with our employees. The war broke out in September; I had got married in August, and Alec, my best man had been away at Territorial Army camp, but finished just in time to the wedding. What I was not told was that he had to go straight back to camp for further training, as war was inevitable. I returned to find that instead of him helping my father in the management of the new works, he was away and did not return until the end of the war. My father was not a fit man, by then, as he had had a leg amputated about 1935, and he died in January 1943. My uncle, aged 80, had retired in 1932, when I first came to the firm, but he was a director and so could sign cheques. When my father died, my mother was made director, and she took over overseeing the payments and cash side very effectively as her predecessor Jane Kingdon had done in 1793-1805. Thinking back, whilst splendid experience, planning, etc., for a new factory, running a foundry and machine shops under war conditions, effectively single-handed, with no real holidays, it must have been stressful and dominated one's life. Just before the war A.B. Green, one of my parents' regular bridge players and the proprietor of Taylor and Bodley Limited, having only a daughter, had made me a director of this company as a sort of possible executor to continue it; at the end of the war. He had found it was time to retire, so we, having already given house room to Parkins Foundry, which had been destroyed in the blitz, organised to take them over and eventually move them under our roof. Henry Holladay was the managing director of Garton and King. In this extract from his memoirs, he describes the Garton and King foundry and life around about Waterbeer Street. Henry Holladay died in May 2007. The Police Station, with the round tower is now a flowerbed, with the Looking Forward bronze in the centre. A rare view of the long lost, Trickhay Street. The rear of Mansfield's Antiques in North Street is the building at the end.